In June, I wrote on Instagram that canning posts were coming to the blog in July and then a few weeks ago I started to get nervous and edited that text to say August! But it’s July 30th, I canned green beans with Grandma on Friday and now I’m making the time to publish this post (in July) as originally ‘promised’. The moral of this very short story is don’t doubt yourself! And. Good planning usually leads to accomplished goals. Motivational pep talk aside, who wants to learn how to can green beans? Check out the stories in my Instagram profile to see a play by play of the canning steps I’m about to list! There’s some bonus footage of our day too, exclusive to IG! 1. Pick or purchase fresh green beans from your garden or local farmers market! Transfer the beans from the water to a colander to drain; be sure any grass trying to hang around is rinsed off! 2. 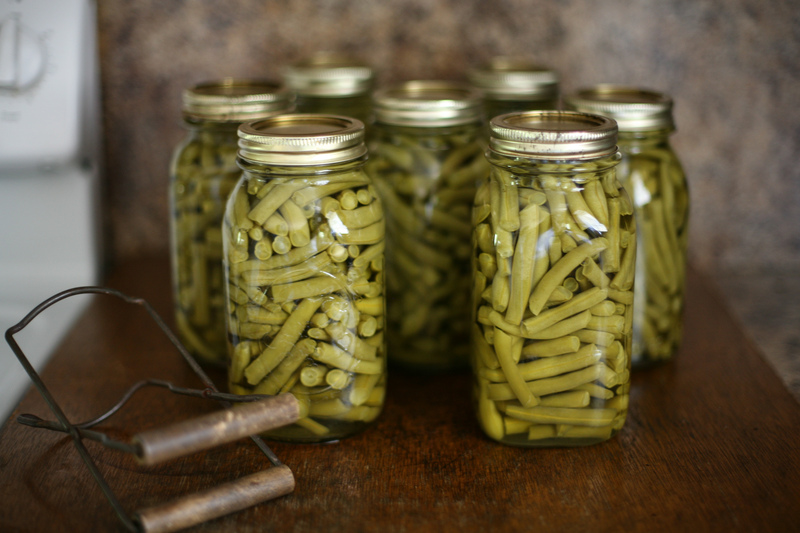 Pack your canning jars with beans! Break beans in half as needed and pack them into your jars. You’ll be able to get quite a few beans in each jar so use a butter knife or gently tap the jar on the counter to move beans around and fill gaps. Fill each jar to the neck with beans. Pack them full, y’all! While you’re filling the jars with beans, sterilize your lids in boiling water on the stove. Fun fact, the saucepan we used to sterilize our lids is about to turn 57 years old! Talk about good solid cookware! 3. Salt and water your jars of green beans! Add just less than or around a teaspoon of salt to each jar. I apologize for being vague with this step, but you know Grandmas and cooking…some things you just don’t measure. 4. One of the most important steps!!! Clean the rim of each jar! 5. Add the lids and rings to your jars! 6. Prep the cold packer and add your jars of beans! Fill your cold packer with cold water mixing in 1/2 cup vinegar. Add the rack and place your jars appropriately inside. Any type of vinegar can be used (we had apple cider on hand) and this helps make your jars clear and shiny when they come out. We all know how important presentation is around here! Carefully lower the rack into the water. Add more water if needed; you want the jars to be completely covered. 7. Cover your beans and let the cold packer take over for a few hours! Cover and bring the water to a boil; this will take roughly one hour. Once boiling, leave on stove for another 2 and a half hours for pints and 3 or so hours for quarts. When time is up, use a jar lifter to carefully remove the hot jars. Set them on a heat resistant surface where they can cool overnight. You will hear them pop as they cool to let you know they’re 100% done. We use a permanent marker to add the month and year to the lids of our jars and most of them are stored in a cool cellar at my grandma’s house. You can also keep them in a dark pantry or cool and dry basement. Happy Canning from our biggest helper of the day, my Grandma’s sweet dog Louie!! This entry was posted in Homemade Alternatives, Recipe Book, Sides and tagged canning, canning beans, canning green beans, cold packer canning, dinner sides, fresh produce, gardening, green beans, sides. Bookmark the permalink.